You can always wake me up for remarkable details on the Kennedy case. Like this one – I found the image above in one of Robert Groden’s books. John F. Kennedy was killed at 12:30 pm. Ten minutes later, Oswald took city bus 1213, driven by Cecil McWatters, aiming for Marsalis Street. Oswald stepped in at the intersection of Elm Street and Griffin Street. The bus continued its way on Elm, towards the Texas School Book Depository that Oswald just left. Photographer Stuart L. Reed was standing on the sidewalk and he made two pictures of the bus – off course not knowing who was in it at that time :) You can see the TSBD on the picture above, here is the other one. Oswald didn’t occupy his seat long – the bus got stuck in traffic. He left the bus at 12:44 pm near Dealey Plaza and two blocks from there he took a cab. Destination: his rooming house at 1026 N. Beckley Avenue. He arrived at 1 pm and left in a hurry, four minutes later. Not long after that, police officer J.D. 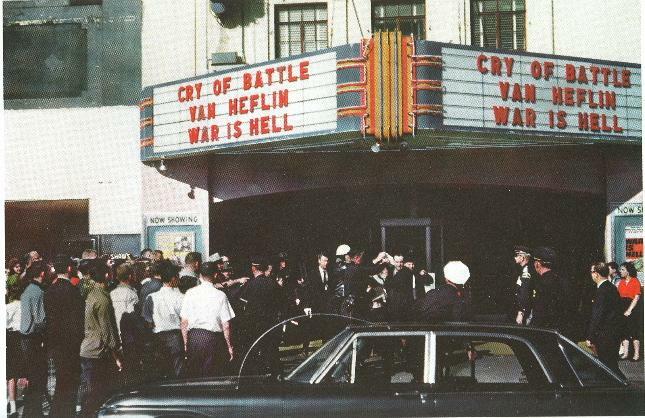 Tippit was murdered and Oswald was arrested in the Texas Theatre. Again, Stuart L. Reed was making pictures, being one of the people in the audience on West Jefferson Boulevard. His pictures of the captured Oswald became famous. While in his room on Beckley Avenue, a police car stopped in front of the house. The car drives by, honks twice, waits, then moves away – according to landlady Earlene Roberts. Why? Who was driving this never identified car?